My last ode to summer is in this bowl. My blueberry vanilla smoothie bowl. This summer I finally jumped on the smoothie bowl train and so far I haven’t looked back. I never understood the appeal of a drinkable smoothie (and still don’t) so when smoothie bowls came into the picture thanks to my gal Georgie from In It 4 the Long Run, I registered for a Magic NutriBullet (AMAZING by the way) and I was so excited to finally experiment with smoothies in a new way. 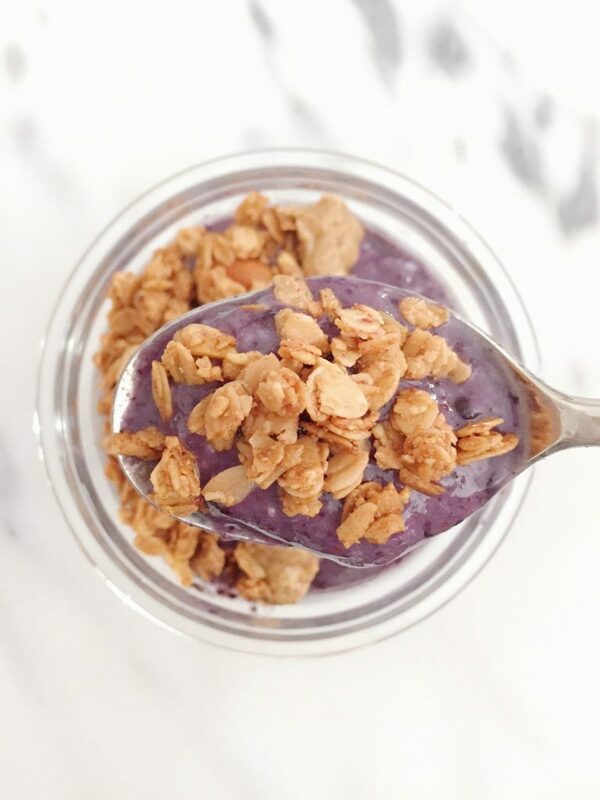 This one is fruity, hearty and of course is filled with a crunch since I cannot eat a smoothie bowl without some sort of crunch from granola or nuts. It’s made with your basic fruit, nut milk, protein, nut butter and granola. The flavors are like eating a blueberry vanilla ice cream cone (if that flavor actually exists). You don’t have to use the same brands I did in this recipe but I do recommend them, and they are some of my absolute favorites. If you have something similar at home, of course feel free to use that. Place frozen banana, blueberries and Vega One into your nutribullet or blender. Add almond milk and blend until smoothie consistency.